One of the most popular products on the market is the PetSafe ScoopFree Original Self-Cleaning Cat Litter Box. This self-cleaning litter box can keep your feline’s box fresh for up to three weeks without any scooping or cleaning. Roughly 20 minutes after your cat exits, the self-cleaning box will sift the litter and dispose of it in a securely lined tray below. The crystal cat litter absorbs urine, neutralizes smells, dehydrates feces, and helps reduce tracking, so your pet won’t get the litter all over the house. Once your litter box is full, simply remove the disposable tray and toss. And, if you have existing stains or smells that you want to remove, consider an odor remover or enzyme cleaner to eliminate tough stains before you place your new litter box. Owners say that the PetSafe ScoopFree box is a great choice to reduce time spent cleaning out litter. Some do note that the metal rake rusts, but other reviewers have found easy solutions, such as coating the metal pieces with rubber to reduce tarnishing. If you’re hunting for a simple solution to endless litter box cleaning, try the PetSafe box. The Pet Mate Arm & Hammer Large Sifting Litter Pan is a low-tech option that makes cleaning a litter box without electricity so much easier. This litter box is basically a traditional one with a sifting pan that makes it easier to clean when the time comes. Each product comes with three pans: two reinforced plastic pans with antimicrobial protection and a sifting tray. The box measures 18.9 x 15.2 x 7.9 inches and weighs just under 3 pounds. Owners love that with the Arm & Hammer Sifting Pan, you can use whatever litter suits your cat best. For just a few dollars more than a traditional litter box, this sifting pan allows you to easily clean your cat’s bathroom. Interested in looking at some traditional litter boxes, too? See our guide to the best cat litter boxes. A household with multiple cats is one that needs even more careful attention to cleaning. To avoid smells and litter box refusal, try the LitterMaid Automatic Multi-Cat Litter Box Self-Cleaning. This automatic cat litter box is designed with multiple-cat households in mind and works well for cats over 15 pounds. A sensor detects when your cat has done her business and triggers a rake that automatically scoops the remains into a tray below. The best part of the LitterMaid box is the paw cleaning ramp that helps reduce litter tracking through your home. This box stays clean for up to seven days and works with any litter of your choice. Owners appreciate that the LitterMaid works with a variety of litter brands and say it lasts for many uses. 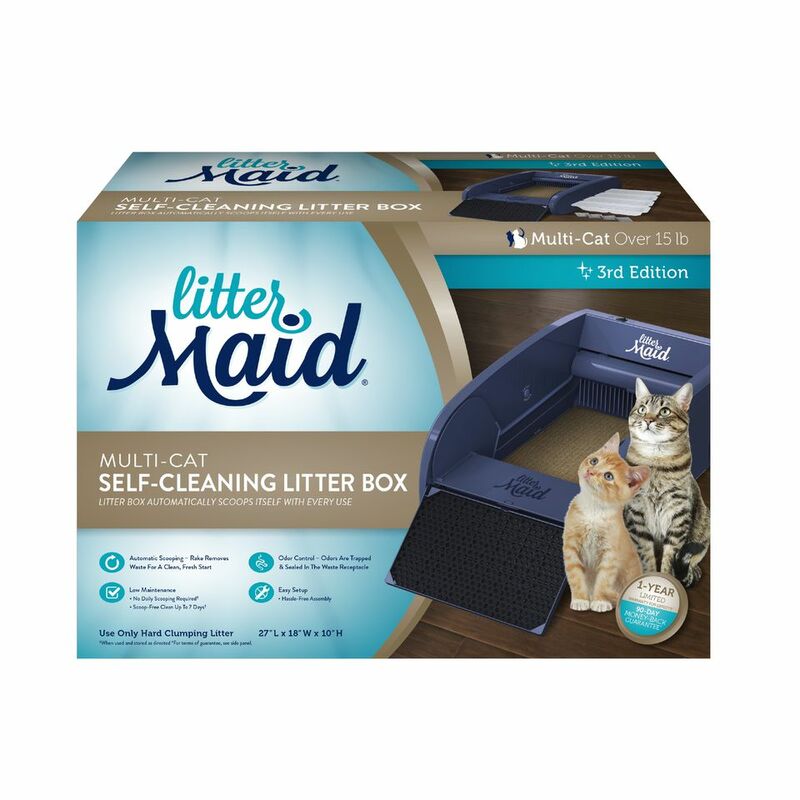 Though there are a few problems (many reviewers note litter spilling out the sides), they are easily fixable with a few “hacks,” such as placing a litter mat around the box. Here’s a guide to the best cat litter you can buy online right now. Whether your cat is a large breed or just on the hefty side, she'll need a litter box that’s suited to her size. Though many automatic litter boxes are made for average-to-small cats, the CatGenie Self Washing Self Flushing Cat Box is a great option for bigger cats. Though this option is a little pricier than some of our other picks, it can accommodate one to two large cats or three average-sized cats. Shaped like a traditional toilet, the CatGenie requires access to an electrical outlet and cold water to function. This box uses litter-like granules that are dust-free and never require changing. After your cat does her business, the CatGenie removes solids and flushes clumps before a sanitation solution cleans the granules and tray to reduce smells, so you don’t need to mess with litter box deodorizers. Finally, the granules are dried out and readied for the next use. Though it takes some getting used to, reviewers say the CatGenie is a great way to keep your home clean and smell-free. Some owners also note if you don't give it a thorough clean every few weeks (or more), the lingering cat poo can begin to smell. Every cat is different, and some just prefer being covered when they do their business. And if your litter box is in the living room or another public place, a covered box can give your cat the privacy he or she needs. The PetSafe ScoopFree Ultra Self-Cleaning Covered Cat Litter Box comes with both side and top entry and provides a plastic cover to shelter your cat while he or she uses the box. This model is similar to the other PetSafe option on our list, with an automatic sensor or litter rake and low-tracking crystals that neutralize the smell and don’t stick to your cat’s paws. When it’s time to clean the box, simply throw away the disposable litter tray. If your cat prefers covered litter boxes, the PetSafe Covered Cat Litter Box is a great way to reduce cleaning and keep your furry friend happy. There’s no denying that litter boxes can be an eyesore in your home. But, of course, they’re necessary if you own a cat. The Litter Robot is an automatic, self-cleaning litter box that’s perfect for the design-savvy cat owner. This tech-forward litter box uses a patented gravity system to separate clumps and deposit them below. The Litter Robot also connects to your smartphone, so you can monitor usage on the go. It comes in black or white, and though it’s the most expensive choice on our list, it’s by far the most advanced and most attractive option that money can buy. The Litter Robot is a great choice if you’re willing to invest in a design-forward litter box. Plus, for $50 you can add on a three-year warranty to protect your purchase. Looking for more ways to splurge on your cat? Here’s a list of our favorite cat beds for your feline. Though many cat owners say they’re worth it, automatic litter boxes are obviously a little noisier than traditional ones. If you’re concerned about noisy motors, we love the Pet Zone Smart Scoop Automatic Litter Box. According to the brand, this automatic box is four times quieter than competitors, allowing you to put the box in a living space or bedroom without disruption. Just 15 minutes after your cat uses the box, a rake will sift through the Pet Zone box and remove clumps. A reusable tray below collects waste, and each purchase comes with a six months’ supply of plastic bags for easy disposal. Owners say the Pet Zone Box is a great choice for public spaces where noise is a concern. Some reviewers note that the plastic bags don’t secure litter if not changed often, but the convenience of easier cleaning is worth more frequent disposal. ﻿Our writers spent 3 hours researching the most popular automatic litter boxes on the market. Before making their final recommendations, they considered 10 different automatic litter boxes overall, screened options from 6 different brands and manufacturers, read over 100 user reviews (both positive and negative), and tested 0 of the automatic litter boxes themselves. All of this research adds up to recommendations you can trust.